Grade A 100% maple syrup. Haven't tried it yet, but it's definitely a lot cheaper than any other supermarket. A good price for real maple syrup, unlike the usual crappy 'maple flavoured syrup' (with the flavoured in small print), which is to be avoided as a scam, just as any fruit juice described as 'xxxx juice drink' is a scam, with the addition of the weasel word 'drink' means 'water containing a small amount of xxxx juice'. Best place for consistently finding real maple syrup is Costco - they usually have plastic jug bottles, currently 1 litre in size, for around £10-12, iirc. A good price for real maple syrup, unlike the usual crappy 'maple … A good price for real maple syrup, unlike the usual crappy 'maple flavoured syrup' (with the flavoured in small print), which is to be avoided as a scam, just as any fruit juice described as 'xxxx juice drink' is a scam, with the addition of the weasel word 'drink' means 'water containing a small amount of xxxx juice'.Best place for consistently finding real maple syrup is Costco - they usually have plastic jug bottles, currently 1 litre in size, for around £10-12, iirc. 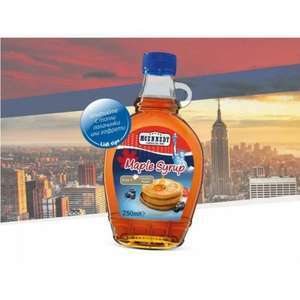 Agreed, Costco is great for large bottles of Canadian Grade A medium - very nice syrup. ...or worse that Clarks maple syrup that's mixed with carob syrup (whatever the hell that is) just plain nasty! For sure. That said, it's all sugar at the end of the day, incuding genuine maple syrup, and is increasingly recognised as a 'white poison' that's responsible for so much of today's obesity and other health problems - come back Lurpak, all is forgiven! You signed up today just to post that? Care to elaborate on your learned taste tests? The £3 one they do is the same as Tescos finest bottle which is double the price! £2.50 for Clarks pure grade in Sainsburys. For sure. That said, it's all sugar at the end of the day, incuding … For sure. That said, it's all sugar at the end of the day, incuding genuine maple syrup, and is increasingly recognised as a 'white poison' that's responsible for so much of today's obesity and other health problems - come back Lurpak, all is forgiven! I'm a big Costco Maple Syrup fan. Have it on my porridge every morning. For years, the dietary advice has been low fat and high fibre. High fibre translates to carbs, which are the real enemy and cause of so many health issues - not just people being fat. It's also much more than just sugar. Many doctors are still promoting bad dietary advice, sadly. Someone recently explained to me that when sitting on a sofa doing very little, our bodies can process fats more efficiently than carbs. Fat has the added benefit of making us feel full, keeping the munchies at bay in the evening and it actually keeps us healthy too. My favorite snack through the day, nuts. Cashews, almonds, pecans and macadamias (Costco do a great tub of these). I'm a big Costco Maple Syrup fan. Have it on my porridge every … I'm a big Costco Maple Syrup fan. Have it on my porridge every morning.For years, the dietary advice has been low fat and high fibre. High fibre translates to carbs, which are the real enemy and cause of so many health issues - not just people being fat. It's also much more than just sugar. Many doctors are still promoting bad dietary advice, sadly.Someone recently explained to me that when sitting on a sofa doing very little, our bodies can process fats more efficiently than carbs. Fat has the added benefit of making us feel full, keeping the munchies at bay in the evening and it actually keeps us healthy too. My favorite snack through the day, nuts. Cashews, almonds, pecans and macadamias (Costco do a great tub of these). Agree on the Costco one and whoever told you about processing fat, while dosing around on the sofa, is 100% spot on.. as can be seen by my recent post in the Curvy Kate HUKD thread here! The cheapest I've seen maple syrup was waitrose for £4.19, this is a steal. I had the aldi one at a friends last week and it was great.. Comes in a plastic bottle with handle I think. You signed up today just to post that? Care to elaborate on your learned … You signed up today just to post that? Care to elaborate on your learned taste tests? saw this in the flyer. great deal. You have to sympathise with the poor Tesco employees, don't you. 10,000 Tesco job cuts isn't good news if you work there, and it's certainly not their fault that Aldi and Lidl are knocking 7 bells out of their profits! Tell you summat for nowt, this maple syrup is good value. went Chicago recently and even in discount retail outlets these bottles were no less than £5. Man this is Chicago I said; only like a couple of hundred miles from Canadia. Love the old Maple on me pancakes. You have to sympathise with the poor Tesco employees, don't you. 10,000 … You have to sympathise with the poor Tesco employees, don't you. 10,000 Tesco job cuts isn't good news if you work there, and it's certainly not their fault that Aldi and Lidl are knocking 7 bells out of their profits! Yes it's all sugar, but the difference between maple syrup and refined "white" sugar is that none of the beneficial stuff has been removed from the syrup, unlike refining sugar. Maple syrup is produced by cutting/drilling into maple trees, which produces syrups high in anti-oxidants (as the tree is trying to fight and seal its "wound") and also containing various vitamins and minerals . Still sugar, still bad for you in excess, but the anti-oxidants are useful at performing various housekeeping activities within our bodies, just as they would in the trees. useful and interesting read Indiannablues . ..this site is like a knowledgebase as well as bargains ! Thanks OP, will get some for the maple bacon i'm planning. Thanks OP, will get some for the maple bacon i'm planning.Scorchio! Really easy to do well when the maple is as cheap as this, will buy about 10 bottles if its around my way (a few stores search maybe, maybe not)! Really easy to do well when the maple is as cheap as this, will buy about … Really easy to do well when the maple is as cheap as this, will buy about 10 bottles if its around my way (a few stores search maybe, maybe not)! I got this in the Witney store (Oxfordshire) and they had about 50 bottles in there yesterday. Thankyou, ..I live in hope have about 30 lbs of bacon to sort out. I hope they have this in my local Lidl. Went there on the first day of the 1kg Nutella hot deal last time and they didn't stock it! I've been eating the Aldi maple syrup and it's really tasty and good price at £2.99, but this price at Lidl is a steal! Brilliant price! Got a couple today. Will try it tomorrow and compare it with Aldi's, which I stocked up on a while ago. Hi, I wondered whether you would spot this post. If the first store you visit doesn't have stock try asking them to call the other store(s) to check and set aside some (saves wasting fuel if none left). Lidl don't give out individual store tel. nos. but I've found they're usually willing to telephone local stores if asked (nicely, of course!!). Good luck! Well, tasted them both and Lidl's is fine, although Aldi's has a little more flavour i.m.o. I hope we're are not all killing the trees ? just came into my mind.